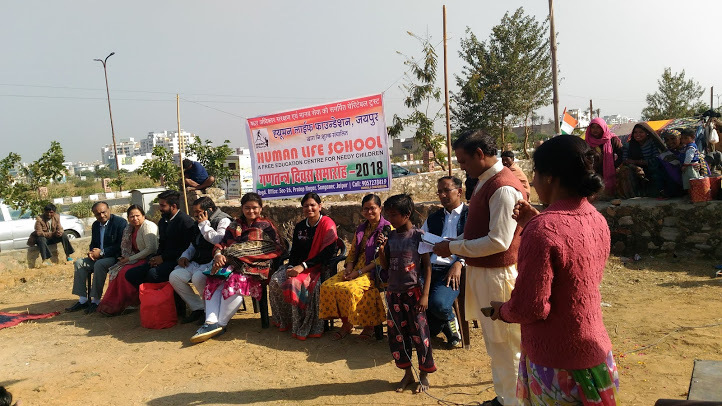 India’s 69th Republic Day was celebrated today with great reverence in our Human Life school (Slum School) at Jaipur. The joint function of students of two branches of Human Life schools has been organized in Jagatputa , Jaipur. The day began with a prayer followed by flag hoisting. This was accompanied by the Flag Song, our national anthem and the pledge. On this occasion Mr and Mrs Lalit Jain, Mr Pankaj Gangwani, Mrs Prescilla le, Mr and Mrs Rajesh Nahata, Mrs Hema Sogani on this day. The Guests spoke eloquently about our diverse nation and the relevance of the Constitution and the Preamble. He enthralled the audience with inspirational stories and reiterated the need for being resolute in our path to achieve our goals. This was followed by other speeches in Hindi, and patriotic poems. The cultural programme included Yoga, Ashana, patriotic song and poems. Children praised brave freedom fighters who laid their lives for the motherland. Finally many gifts has been distributed to those who students who had participated in different activities and Laddus, stationery and breakfast packets to everyone. The Annakshetra Ngo, also distributed Tang fruit juice to everyone who attended the program. Today we are proud of our nation’s achievements and look ahead to a bright future for our country India which has flourished despite adversities to rise victorious. Hail India! Hail our motherland! Jai Hind!